Become best friends with your sweet tooth with one of our premium hampers! Oblige your sweet tooth with this wonderful selection of Sweet Hampers from Everything But Flowers. From creamy decadent chocolate enrobed fruits and nuts, toffee popcorn brittle to classic handmade chocolates. It doesn't get any sweeter than this! It’s easy to give someone with a sweet tooth a present. Simply give her cookies, chocolate, or cake and you’re good to go. But if you’re really thinking of your gift receiver, then you wouldn’t give them just these items; you would give them a collection of all their favourites and more! This is why we offer sweet hampers as a present to give your loved ones a basket of all their favourite things. When it comes to hampers, trust us, we are one of the best. Who can resist sweets? And who can resist a lot of sweets? Now, you can enjoy sweet delicious treats with a sweet hamper. Indulge your gift receiver with a hamper full of his/her favourite sweet treats. Satisfy your cravings by getting one for you, too! Hampers come in a variety of size and themes: you have savoury sweets for the food lovers who love their food hot and savoury, you have pamper hampers for the stressed-out mums who need a little DIY spa day, you have vanity hampers as a present for men who like to enjoy the luxurious things in life. And now, we bring you the sweet hamper so that you can make each day extra sweeter. The Sweet & White Hamper is a classic, while you can never go wrong with the Luxury Hamper. 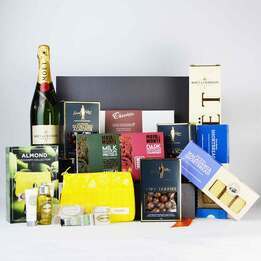 Of course you can always meet in the middle with our beautiful Pure Indulgence Hamper. All of these wonderful Hampers are sure to make your sweet tooth happy. Sweet Hampers are one of the things that we, here at Everything But Flowers, do best. Our sweet hampers are all filled with premium treats that you and your loved ones will surely enjoy. Spoil yourself with one or two by checking out our sweet hamper favourites, because you can never have too much sweetness in life. For the ultimate chocolate lovers, check out this Luxury Chocolate & Champagne Hamper filled with well-loved chocolate and French pastries. Enjoy a romantic night with the French pastries, candied peanuts, handmade chocolates, and a bottle of Veuve Clicquot Yellow Label BV Champagne to top it all off. For the very special women in your life, get Pretty in Pink Pamper Hampers as a present for them! This gourmet choice comes with deluxe biscuits and sweets like French pastries, handmade chocolate, a bottle of fruity Brown Brother’s Victorian Crouchen Riesling Rose and gifts and accessories of soap, hand cream and body butter for the ultimate pamper hamper. For one of our most popular choices, check out the Sweet & White Hamper which is perfect for almost any occasion - whether it is a birthday, a holiday event, or even a corporate gathering. You get the best of both worlds with the sweet and savoury offerings this hamper has. This collection includes savoury crackers, fruit paste and olives, sweet chocolate vanilla fudge, chocolate cinnamon biscuits, citrus butter biscuits, a box of chocolates, and a bottle of 2014 Devil’s Corner Tasmanian Sauvignon Blanc. Get only the most inspired gift ideas here at Everything But Flowers. We have everything from gifts for him and her, gifts for kids, homeware gifts, corporate presents and even novelty items. You are sure to find a gift here that your friends and family will love. Don’t waste time, shop here at Everything But Flowers now!